Now at the most northerly latitude that I have ever lived, the Canadian penchant for steaming cups of coffee makes a lot of sense. But I’ll never join in drinking the bitter stuff, as heavenly as the aroma is. As an alternative, hot tea has its appeal, yet sometimes I find myself wanting more flavour. And for flavour, spiced cider is the way to go. Inspired by a delicious apple pie recipe, the fruity apple and berry flavours become tasty treasures in this drink. I never knew that I could make real cider without a press, but I recently adopted a technique from Holly’s Helpings. 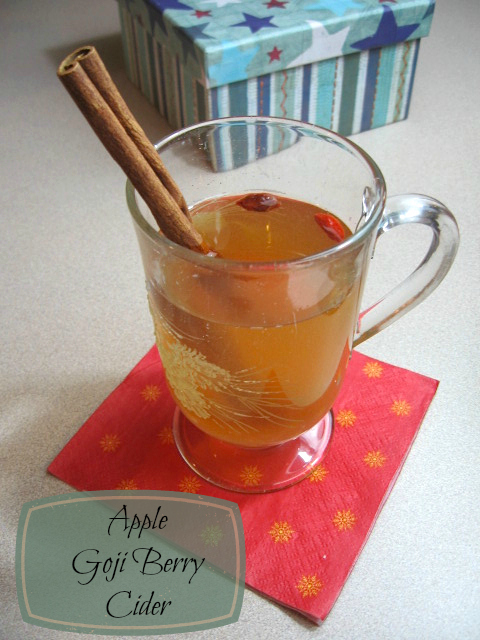 I love that homemade cider can be so simple and doesn’t require any special equipment! In a crock pot or heavy pot, combine apples and juice. Heat to a simmer (turn on low setting on crock pot) for 3-4 hours. Gently crush apples with a spoon. Add cinnamon and other spices to taste and simmer for one more hour. Ladle liquid and apples into a strainer set over another pan. Let cider drain down and then gently reheat the filtered cider. Place goji berries into serving mugs. Pour or ladle the hot cider into mugs and let the cider and berries steep for a few minutes. Serve warm. Traditional Tuesdays, Allergy Free Wednesdays, Fall into the Holidays, Savoring Saturdays, and more. Oooh this sounds delicious, although I love coffee sometimes you just need something else!! This sounds so nice 🙂 The goji berries are a great touch! Can you taste a difference with or without them? Spiced cider is one of those perfect comfort drinks, that can make the most rotten weather, most tedious days or horrible moods just fade away. I don’t make it often enough! Thanks so much for linking up to Smoothie OTW, I hope you’ll join us again soon! I plan to link up more drinks next time! I’m so glad that I discovered your blog (via Ragdoll Kitchen)! This sounds and looks really good! Thanks for joining us at Marvelous Mondays, pinned to my MM board! Oh I love goji, thank you for sharing the recipe! I can already smell the cinnamon! I hope you get to enjoy it soon! Thrilled to have inspired a tasty toasty drink with a little grateful apple goji berry pie. (Just a thought, but I might be inclined to add a little vanilla vodka, just sayin!) Cheers. Putting apples and goji berries together in that pie was brilliant (and obviously inspiring)! I hope you can try the cider too! It was very good. Though I confess I do miss having the convenience of a Trader Joe’s in town. They make a mean cider too. Thanks for commenting! I bet this is lovely! I made a berry and apple galette for Thanksgiving this year. My name is Katie and I host Fall Into the Holidays, now open. All entries get pinned. I would love to have you link up! I LOVE Gojis! I have been searching for a “certified” nut free brand. They are usually processed in the same plant with tree nuts, which my boys can have. Hopefully I’ll find a brand that doesn’t have the risk of cross contamination because I know they’d love them too! Thanks for sharing at Gluten Free Fridays. That’s great! I was wondering when Savoring Saturdays would resume. Joy and peace to you and your family.